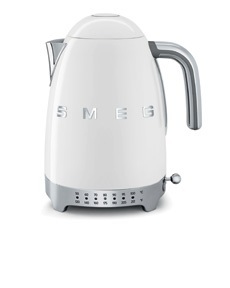 We are thrilled to expand our portfolio of stylish Small Domestic Appliances from Smeg, with the addition of the Smeg 50’s Retro Style Hand Blender, Variable Temperature Kettle, and 2 Slice and 4 Slice Toaster. The new ranges offer a modern twist to the well-known retro design that Smeg are renowned for. With a stylish white finish and improved technology, this collection strikes the perfect balance between iconic design and contemporary innovation. 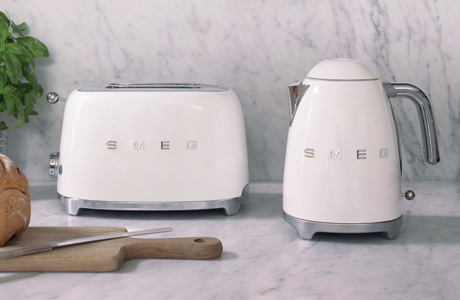 Each appliance comes in a range of colourways and features Smeg’s iconic styling and aesthetic. 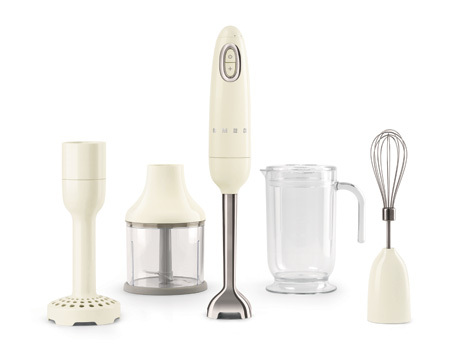 Designed to be durable, functional and comfortable with its ergonomic and anti-slip grip, the Retro Style hand blender is an indispensable small home appliance for cooking quickly and intelligently. The convenient speed control at the top of the grip makes it easy to operate, while the Turbo function makes the most of the 700 W motor. The new member of the Smeg family can also blend and chop even the toughest fruits and vegetables, always guaranteeing the best results in terms of softness and creaminess. The stainless steel arm and blades, combined with the exclusive FLOWBLEND™ system, ensure excellent cutting results and easy preparation. View the product and the four available colour options here. Beautifully crafted with a stainless steel body, and available in seven colours, the Retro Style variable temperature kettle has a large capacity of 1.7 litres. Features include a push-pull opening lid, 360° swivel base, and an automatic shut-off at 100°C. To maintain it’s pristine design, it has a removable and washable stainless steel lime scale filter and a concealed heating element that prevents lime scale build-up. View the product and the seven available colour options here. 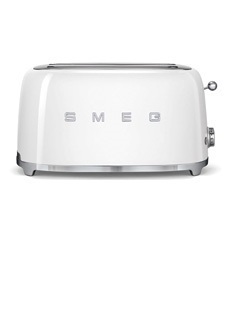 Smeg produces both 2 and 4 slice versions of its popular retro toaster. They are beautifully made in deep drawn sheet steel and have extra-wide slots that are perfect for thick-cut bread and bagels. Other features include 6 toasting levels, 4 functions (defrost, reheat, cancel and a bagel setting), illuminated dials and a touch-release removable stainless steel crumb tray. The built-in cord keeps things neat and tidy while anti-slip feet ensure everything stays in place. Optional accessories include a sandwich rack and bun warmer. Available in seven colours. View the 4 slice toaster hereand the 2 slice toaster here. Find out more about the latest solutions to the Häfele product range, as well at the latest industry trends in What's New: The Spring Edit. View the brochure online or get it delivered straight to your doorstep.